Connected Autonomous Vehicle development funding goes to British powerhouses of automotive research and development. 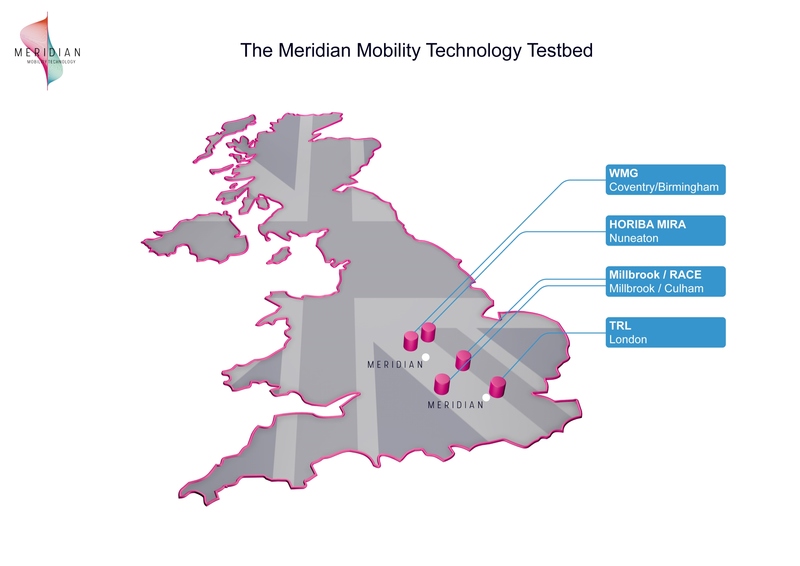 Meridian Mobility welcomes the announcement from the government that it has awarded £51 million funding for four consortia to develop the UK’s connected and autonomous vehicle (CAV) testing capabilities. This is the first investment by government and industry through Meridian to develop a coordinated national platform of CAV testing infrastructure. Funding has been awarded to consortia led by HORIBA MIRA, Millbrook, TRL and Warwick Manufacturing Group (WMG). It will be used to enhance the organisations’ testing facilities and together will help to position the UK as a global hub for CAV development in a market predicted to be worth £51 billion by 2020. Projects focus on moving the industry from virtual computer simulation to real world testing, and include the construction of a new high-speed testing facility in Nuneaton, Warwickshire to semi-controlled environment in Culham, Oxfordshire, and real-life public testing in Birmingham, Coventry and London. * The TIC-IT consortium, led by HORIBA MIRA in partnership with Coventry University, will receive a grant of £13 million in a £26 million programme to create a purpose built, safe environment for testing CAV up to the limit of operability; which is critical to ensure consumer confidence. The unique test environment will enable a wide range of CAV scenarios to be tested. * Millbrook and the UKAEA’s RACE will operate a testbed for the development of CAV technologies across two sites, offering the full spectrum of controlled to semi-controlled urban environments and 90 km of roads. Investment in infrastructure, 5G emulation, data storage, vehicles and simulation, together with unique access to a 2,000 adult population on a secure site, will enable testing to capture all aspects of real-world operation for CAVs,including Mobility-as-a-Service (MaaS) and other social impacts. * TRL will receive a grant of £13.9 million in a £19.2 million programme to launch The Smart Mobility Living Lab: London, which is designed to be an open innovation environment, providing a real world urban testbed capable of demonstrating and evaluating the use, performance and benefits of CAV technology and mobility services. Contributors from across the automotive sector, transport service providers, SMEs, local and central government and research bodies, will collaborate together to exchange ideas and develop technical and business solutions for the future adoption of smart mobility solutions. * The UK Central CAV Testbed, led by Warwick Manufacturing Group (WMG), will receive a grant of £17.6 million in a £25.3 million programme to be based on 80 kilometres of urban roads in Coventry and Birmingham, creating a world-leading connected infrastructure and eco-system, developing the next generation connected and autonomous (CAV) vehicles and positioning the Midlands as a centre for cutting-edge automotive and communication technologies. Meridian was launched in September 2017 to support the development of UK CAV technology by bringing together the country’s leading OEMs, SMEs and start-ups. A partnership between the Centre for Connected and Autonomous Vehicles (CCAV), Automotive Council and the Advanced Propulsion Centre, Meridian aims to create one of the world’s most efficient CAV communities by encouraging cross-sector collaboration.